Does any city really need more signage? Judging from Walk Your City, the answer appears to be ‘yes’ and for economic, environmental and health reasons. Not a bad ideal, but I’m not convinced that the application’s idea really stands up to scrutiny. The originators claim the approach “empowers you to promote walkability” but whatever that means, adding more plastic signs and zipties certainly isn’t going to improve anyone’s environment or perhaps encourage “walkability”. 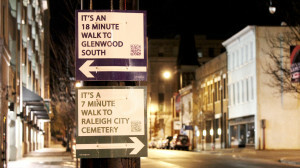 What the idea does draw attention to, however, is that your signage system needs to be much more attuned to the needs of all travelers – not simply those in cars or with smartphones. Of which there are increasingly many, better examples than Walk’s.